There are only few seats left in our theaters (tickets can be reserved by purchasing a Pick Your Price ticket through the Alamo Drafthouse website), so we're opening up our overflow screening space in The Highball with free RSVPs. The DreamWorks episodes will run while the game and activity stations stay open. For those watching the screening in The Highball, plan to arrive at 10 am to enjoy the pre-screening activities and the screening will start at 10:30 am. To attend, please complete our FREE RSVP below. RSVPs will be admitted first come, first served, and only up to venue capacity. Please note The Highball is not a traditional screening space and that unlike the reserved Screening Tickets, seating & admission is not guaranteed. DreamWorks Animation Television has teamed up with ATX Television Festival and The Syndication Project to bring some awesome Saturday morning cartoons to kids and parents alike. Join us for the our annual Best Morning Ever, a family-friendly cartoon breakfast at the Alamo South Lamar & The Highball! What is the Best Morning Ever? Well, get ready for tasty breakfast treats and amazing games & activities before snuggling up to watch DreamWorks Animation Television's Trolls The Beat Goes On!, Spirit Riding Free, and The Epic Tales of Captain Underpants - and a special sneak peek at Boss Baby: Back in Business! To reserve your seats in the theater, simply purchase a Pick Your Price ticket through the Alamo Drafthouse website. Tickets are $1, $3, or $5 - with 100% of ticket sales donated to Dell Children's Hospital. Tickets default to $5 while you select your seats, so when you reach the checkout page, select "edit order" to select your ticket amount. And as always, we encourage you to come in pajamas - both little and BIG kids - we'll be wearing ours! To help folks with planning, this year you'll be able to pick your seats in advance and guarantee your place in the theater! To reserve your seats, simply purchase a Pick Your Price ticket through the Alamo Drafthouse website HERE. Tickets are $1, $3, or $5 - with 100% of ticket sales donated to Dell Children's Hospital. Tickets will default to $5 while you select your seats. When you reach the Checkout Page, select "Edit Order" to select your ticket amount and then continue. As an alternative to theater seating, we have a limited number of free RSVPs available for viewing in The Highball. Please RSVP above, and note that seating is not guaranteed this year and is subject to availability and capacity. Head on in and take a picture in our Smilebooth photo booth, parents get your coffee, kiddos grab some juice, and everyone get a few KIND snacks while you play in our activity stations! Sometimes you just want to play! Not done playing yet? No problem! Activity stations and games in The Highball will be open the duration of the event. We'll have some awesome games and coloring stations for kids of all ages! Make sure to reserve your seat with a Pick Your Price ticket (available on the Alamo website HERE) so you can head into the theaters 30 min before your showtime to pour yourself some sugary cereal and get settled into your seats. 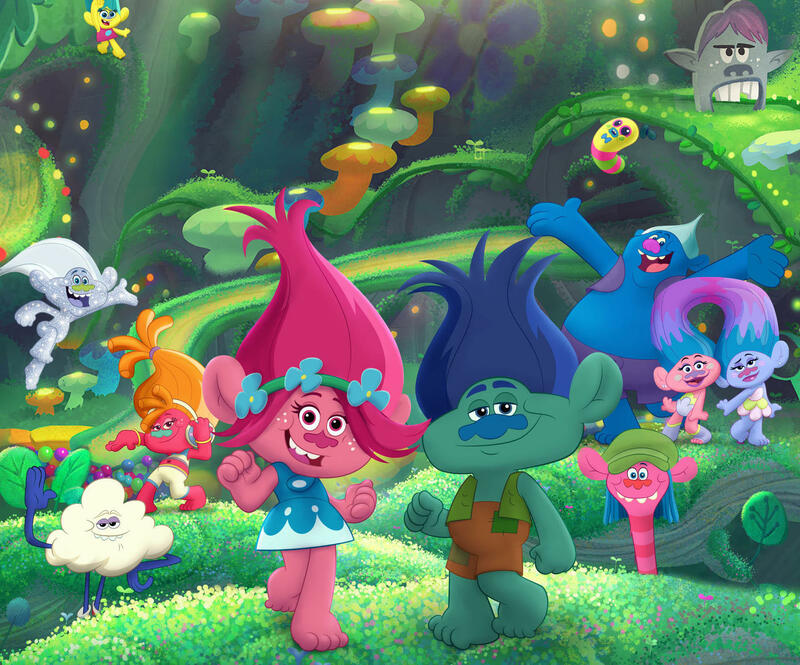 DreamWorks Animation Television's Trolls The Beat Goes On!, Spirit Riding Free, and The Epic Tales of Captain Underpants will be shown in two theaters with staggered start times. Make sure to keep an eye on the time and listen to the announcements so you don't miss your screening! All good things must come to an end! It's time to wrap up the Best Morning Ever, but we'll see you next year! Thanks so much for joining us and we'll see you soon! Trolls The Beat Goes On! ﻿"Cloudy with a Chance of Hugs / Creek Week"
The Trolls share a special hug with a special Troll on Hug Day. ﻿"Horrible Hostilities of the Homework Hydra"
the most important thing in the world: comic books. ﻿"Lucky and the Mysterious Map"
treasure map that sends them on the adventure of a lifetime. while angling to achieve the near-impossible: a work-life balance. "Cloudy with a Chance of Hugs / Creek Week"
The Trolls share a special hug with a special Troll on Hug Day. And when Creek returns to Troll Village, everyone is willing to forgive him except Branch. "Horrible Hostilities of the Homework Hydra"
When George and Harold go back in time to stop the invention of homework, they realize they also eliminated the most important thing in the world: comic books. "Lucky and the Mysterious Map"
During a camping trip, Jim gives Lucky and the girls a treasure map that sends them on the adventure of a lifetime. With the help of his big brother and partner-in-crime, Tim, Boss Baby continues to navigate the cutthroat corporate jungle gym of Baby Corps, while angling to achieve the near-impossible: a work-life balance. Entry into The Highball for pre-screening activities is first come, first served, and is subject to event capacity. Pick Your Price ticket guarantees entry into the theater and is an assigned seat for the cartoon screening. You must reserve your seat with a Pick Your Price ticket to enter the theaters. Get Tickets HERE. If both theaters sell out, we will show the cartoons in The Highball event space. Please note The Highball is not a traditional screening space and that seating is not guaranteed. Admission will be first come, first served, and is subject to event capacity. Any and all giveaways are subject to availability and are NOT guaranteed. if you have any questions or need any assistance! DreamWorks Spirit Riding Free © 2018 DWA LLC. All Rights Reserved., DreamWorks Trolls © 2018 DreamWorks Animation LLC. All Rights Reserved., The Epic Tales of Captain Underpants © 2018 DreamWorks Animation LLC. All Rights Reserved. Dreamworks The Boss Baby Back In Business © 2018 DreamWorks Animation LLC. All Rights Reserved.